Please Mum is having a huge 50% off the entire store sale from April 29-30, 2011. The sale is extended for one extra day if shopping online. Kids outgrow and tear their clothes so quickly. With a savings of 50% off, parents should definitely checkout Please Mum and take advantage of this offer. Click here for more information about the deal at Please Mum or to shop online. 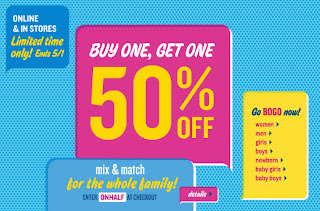 Valid online and in-stores, Old Navy is offering a buy one, get one 50% off from now until May 1, 2011. While supplies last. Cannot be combined with other offers or discounts. For online purchases, enter the promotion code “ONHALF” at checkout. Some additional restrictions apply. 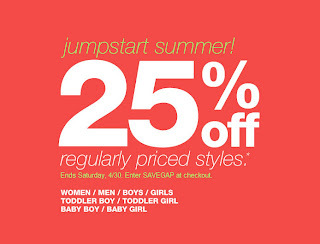 Until April 30, 2011, save 25% off on all regular priced items at Gap. This offer is valid online and in-stores. The promotion excludes Gap Factory and Gap Generation stores and is not valid on sale items. To shop online, enter the promo code “SAVEGAP” to receive the discount. Other conditions apply. In case you missed last weeks post and because Mother’s Day is just around the corner, I decided to post Coach Factory’s latest printable coupon. From now until May 1, 2011, save an extra 30% off your purchase at Coach Factory with this coupon. This offer applies to already reduced prices. 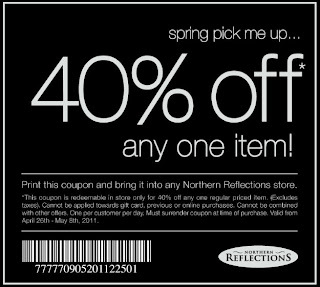 Print this coupon and present it at time of purchase at any Northern Reflections store to receive 40% off one regular priced item. One coupon per customer, per day. This promotion can not be combined with any other offers and is valid until May 8, 2011. Click here to print the Northern Reflections 40% off coupon. Get your teenagers off the sofa, away from their computers and video games this summer by registering them for GoodLife Fitness`s Free Teen Fitness Program for youths between 12 and 17 years old. This program is offered at all GoodLife Fitness Clubs between 8am-4pm, 7 days a week for July and August 2011. Participants will have full club access except for tanning, pool, sauna, whirlpools, and Hot Yoga. Registration begins on June 1, 2011 at www.goodlifefitness.com. Take advantage of this opportunity to teach your children the importance of achieving a healthy and happy lifestyle. Click here for more information about GoodLife Fitness`s Free Teen Fitness Program. For a limited time, Banana Republic has an incredible 40% Off your entire purchase sale from April 28 – 30, 2011. This sale is available in-store and online. If you’re shopping online, enter the promo code “ROYAL40” at checkout to get the discount. Not valid on men’s and women’s bags, shoes, Monogram, Heritage and third party branded merchandise. Banana Republic offers free sipping on any order over $50. Click here to shop Banana Republic online now. 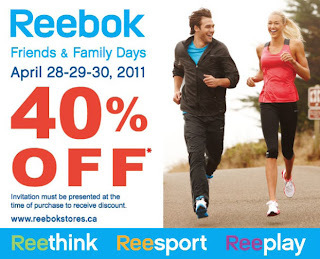 During Reebok`s Friends & Family Days, receive 40% off on regular priced and sale merchandise. This offer is valid from April 28-30, 2011. Print out and present the invitation below at your nearest Reebok store to redeem the discount. The link below also lists all the participating stores. Some additional conditions apply. Click here to print the Reebok 40% off invitation. Save big on lingerie, sleepwear and more by visiting La Vie en Rose between April 28-May 1, 2011. Receive 35% off on all regular-priced items online and in-store. Simply print out and present the coupon at time of purchase in-store or use the promotional code “VIPS11″ at checkout online. La Vie en Rose offers free shipping on online purchases of $75 or more. Some additional restrictions apply. Click here to print the 35% off coupon or to buy La Vie en Rose online now. Receive 20% off on online purchases of $50 or more at Robeez.com until May 11, 2011. Use the promo code “MOTHERS2011″ at checkout to receive the discount. Offer is valid for in-stock merchandise only, while supplies last. Some additional conditons apply. Remember that if you purchase two or more pairs of Robeez footwear, standard shipping is free. Click here to buy Robeez online now or for more information about the deal. Right now Payless Shoesource is having their buy one item and get the second item of equal or lesser price for 50% off. This applies to everything in the store. This offer is valid until May 16, 2011. I love Payless Shoesource because you can stock up on shoes at a low price, and with this offer your closet will be overflowing with shoes. Click here to buy Payless Shoesource online now or for more information about the deal. All in stock cedar lumber, decking, fencing posts and decking accessories are 10% off at Rona. This offer is valid from now until April 27, 2011. For online purchases add the 10% off offer to the shopping cart to receive the discount. Check details in-store. Click here to buy Rona online now or for more information about the deal.